The carrots from the garden are a bit weird. 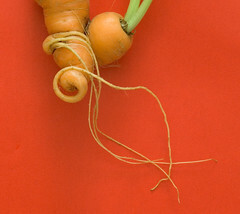 This is a photo of two carrots that have grown together. When placed on red paper I saw the evil carrot. Some of the most creative stuff I have shot. This entry was posted on Sunday, July 23rd, 2006 at 10:54 pm	and is filed under Ramblings. You can follow any responses to this entry through the RSS 2.0 feed. Responses are currently closed, but you can trackback from your own site.